Renew your love of snowmobile riding! Remember the first time you took on the white stuff and the thrill of your first snowmobile ride? The power beneath you, the roar of the motor, the wind on your face! You can have that excitement, again, when you ride through the Chilcotin Mountain Range. You can use one of our experienced guides, or take off on your own on safe trails – 500 km of trails! 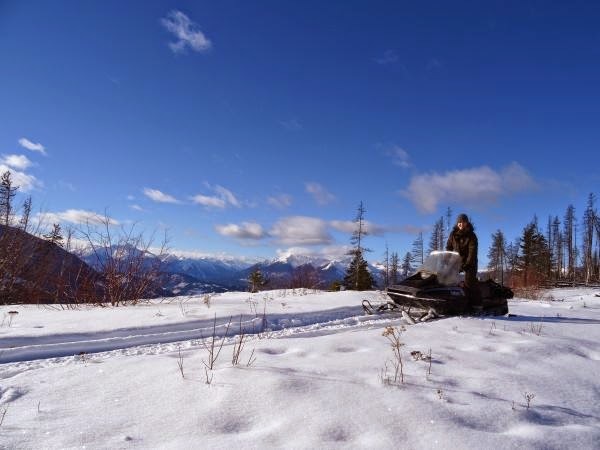 - in remote back country where you may catch sight of a wolf, mule deer or moose. My first snowmobile riding experience was on a Snowcruiser in Northern Ontario many years ago. But I still remember the excitement and the thrill of riding over the snow for the first time. I was just a teen and being able to get out into the back bush was a new freedom for me. I put the snowshoes aside and pulled the cord for a moonlit ride through a winter wonderland where diamonds sparkled on the top of the snow and the crisp air invigorated me. Suddenly a whole new world opened to me. I was free to roam wherever I wanted to go. I fell in love with snowmobiles and snowmobile riding. I used ours to deliver the daily paper on my newspaper route, and zoomed overland in joy instead of slowly trudging along the roadways. After supper, I would go out again, to see the stars and experience a winter night all on my own. My father kept designing the ultimate carry box and the ultimate sleigh. We had family fun days and gave rides to all the kids in the neighborhood. After a brisk ride and maybe a bracing flutter of snowflakes in your face, you came back inside for hot chocolate or stood around a campfire roasting weenies. Everything tasted better when you ate it outside! Is it time to renew your love of the sport? Just you, the snow, and your snowmobile riding machine.